On Boxing Day 2002, 49 teams with cars costing less than �0 each started a 3,200 mile adventure that took them from the South coast of Great Britain (Plymouth) to the West coast of Africa (Dakar). The teams completing the challenge arrived in Dakar on 13th January 2003. A set of Golly brooches were produced to mark the challenge and to help raise funds for the charities to benefit from the event. 62 sets were produced at �per badge. 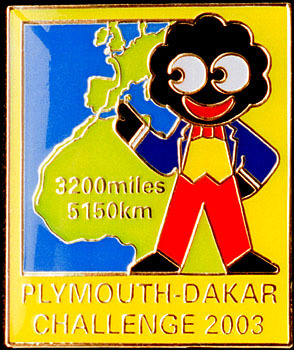 The Plymouth-Dakar Challenge web site has details about the 2002/2003 event, the next challenge and the charities that benefit. Use the mouse to re-trace the journey!